The Greek city-states were the dominant settlement structure of the ancient Greek world and helped define how different regions interacted with each other. 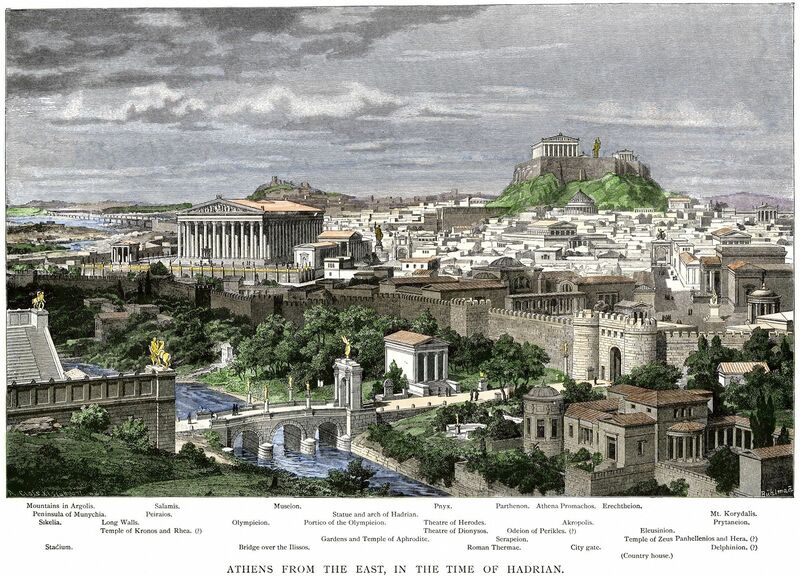 This hand-colored woodcut gives us an artist's concept of what Athens might've looked like in the time of the Roman emperor Hadrian, when its iconic monuments and temples were still in their prime. A city-state, or polis, was the community structure of ancient Greece. Each city-state was organized with an urban center and the surrounding countryside. Characteristics of the city in a polis were outer walls for protection, as well as a public space that included temples and government buildings. The temples and government buildings were often built on the top of a hill, or acropolis. A surviving example of a structure central to an ancient acropolis is the famous Parthenon of Athens. The Parthenon was a temple built to honor the goddess Athena. The majority of a polis’s population lived in the city, as it was the center of trade, commerce, culture, and political activity. There grew to be over 1,000 city-states in ancient Greece, but the main poleis were Athína (Athens), Spárti (Sparta), Kórinthos (Corinth), Thíva (Thebes), Siracusa (Syracuse), Égina (Aegina), Ródos (Rhodes), Árgos, Erétria, and Elis. Each city-state ruled itself. They differed greatly from the each other in governing philosophies and interests. For example, Sparta was ruled by two kings and a council of elders. It emphasized maintaining a strong military, while Athens valued education and art. In Athens every male citizen had the right to vote, so they were ruled by a democracy. Rather than have a strong army, Athens maintained their navy. Greek city-states likely developed because of the physical geography of the Mediterranean region. The landscape features rocky, mountainous land and many islands. These physical barriers caused population centers to be relatively isolated from each other. The sea was often the easiest way to move from place to place. Another reason city-states formed, rather than a central, all-encompassing monarchy, was that the Greek aristocracy strove to maintain their city-states’ independence and to unseat any potential tyrants. large, flat-topped hill that is the highest point of the city of Athens, Greece. loosely united civilization founded on and around the Peloponnese peninsula, lasting from about the 8th century BCE to about 200 BCE. elite group of people based on wealth or social status. trade, or the exchange of goods and services. system of organization or government where the people decide policies or elect representatives to do so. system of government in which national power is invested in one person, usually a king or queen.